40189 RA5475.jpg 500X638\RA5475.jpg Send A Hint! Product Description: less text Express yourself in the cutest way possible when you surprise that magical someone with this awesome gift. 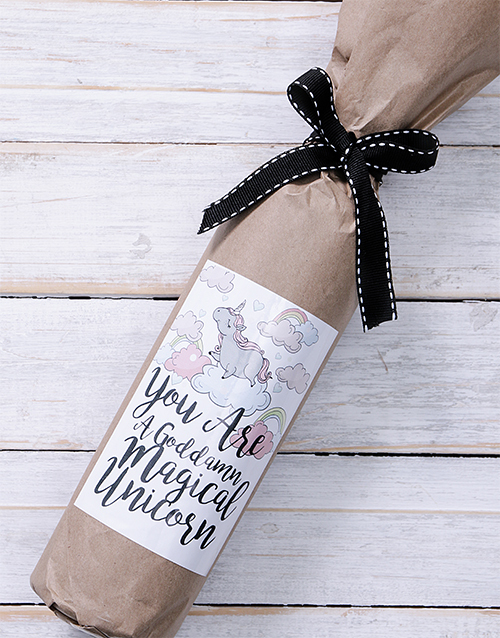 A bottle of Backsberg Red wine is wrapped in lovely craft paper and branded with a unique 'You Are a Goddamn Magical Unicorn' label design. Send this gift to someone awesome now! Get this Magical Unicorn Wine In Craft Paper delivered with NetFlorist.